You just can't go wrong with Mac and Cheese. This recipe is filled with the creamy goodness of Smoked Gouda, sharp cheddar and Jarlsberg cheeses. Bacon, onions and jalapenos bring it up a notch too. Cast Iron is perfect for baking mac and cheese in. In the oven or on your grill. Cook pasta as directions on package until al dente. In a large pan melt butter. Stir in flour and whisk until sooth. Add milk and spices, and mustard. Stir over medium heat until mixture thickens and is smooth. In separate fry pan, fry bacon and then in a little of the bacon grease saute vegetables until translucent. Add to thickened milk mixture. Remove from heat and stir in grated cheeses. Stir in feta and crumbled bacon. Pour hot cheese mixture over drained pasta. Spray a 9x13 pan OR a large or two small cast iron pans with oil and add macaroni and cheese mixture. Melt butter and stir in cheese and bread crumbs. Sprinkle mixture over mac and cheese. Bake mac and cheese in 400ºF oven for 30 minutes. If you like it spicy garnish with a slices of jalapenos. I'm sure glad you are on the ball....I seem to have added butter twice and omitted the mustard. I've corrected things on the post now. Have a great day! Oh yummy!!! I think this will be on our supper table tonight - it sounds amazing. 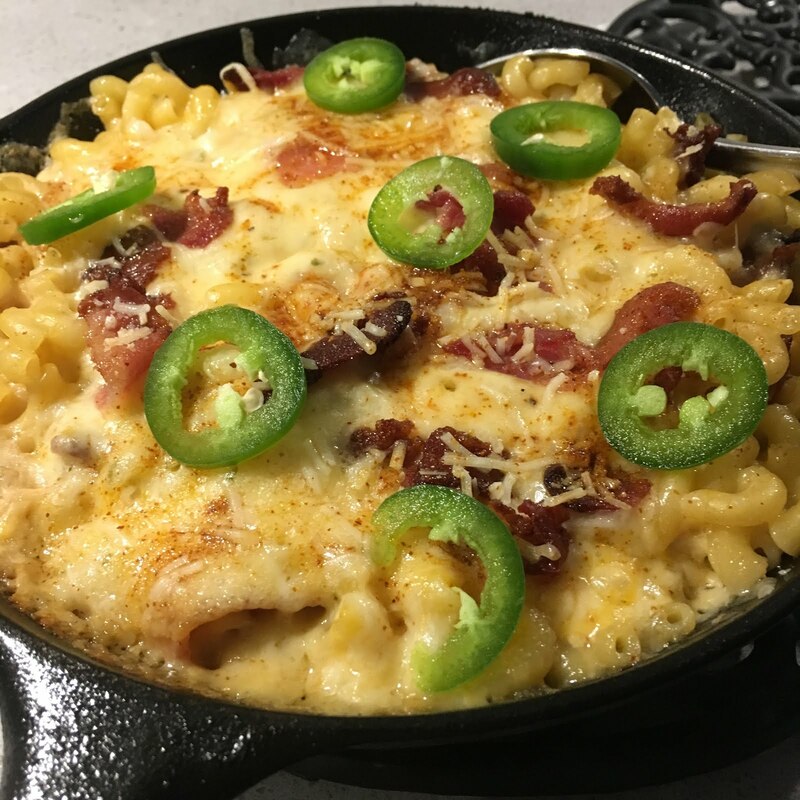 Mac n Cheese has become one of our favorites...and adding this twist will be just perfect. Even my adult children like it. this will go on my Green Egg.